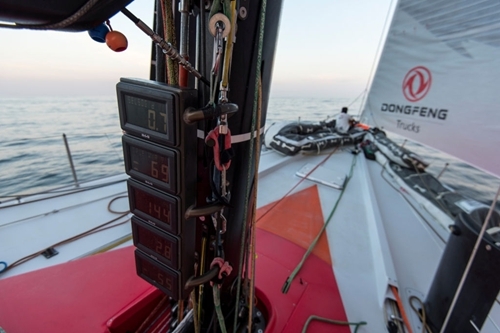 Dongfeng Race Team (Charles Caudrelier/FRA) saw their runaway lead in Leg 3 cut down to less than 30 nautical miles (nm) on Tuesday as the Malacca Strait caused headaches galore for all the fleet. A day earlier, the Chinese boat had been surfing towards an apparently easy win into their home port of Sanya with an advantage of more than 106nm on the chasing pack. January 19, 2015. Day 16 of Leg 3 to Sanya on board Dongefng Race Team. Our sped, going backwards on the GPS. But as the sun arose on Tuesday in the Malacca Strait, the 500nm stretch of water that separates the Indonesian island of Sumatra and Malaysia, the early position reports told a completely different story. While the rest of the fleet were flying along in good pressure, Caudrelier and his crew were effectively moored up in zero wind. At one stage, their lead was cut to just over 16nm. Slowly but surely the weather gods finally smiled again on Dongfeng Race Team, which would be the first Chinese-backed team to win a leg in the 41-year-old race if they are first into Sanya around a week from now. By 1240 GMT, their third leg lead over Abu Dhabi Ocean Racing (Ian Walker/GBR) was back to 29.8nm with MAPFRE (Xabi Fernandez/ESP) 1.5nm further adrift in third. For Walker’s crew it has been a roller-coaster 24 hours in which they have progressed from fourth to second despite having to drop anchor at one point when the strong Malacca Strait current threatened to push them backwards in a particularly windless zone. January 20, 2015. 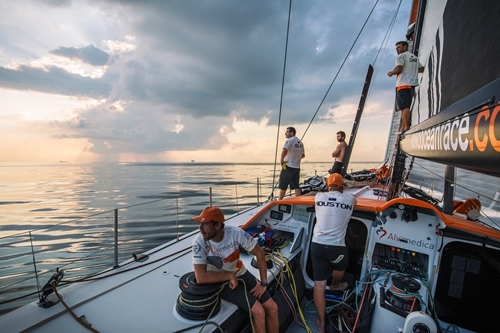 Day of 17 Leg 3 to Sanya, onboard Team Alvimedica. Halfway down the Malacca Strait and it’s a three-way tie for second place, but fickle winds and an obstacle strewn path still remain before Singapore. Everyone waits on deck for hints of new wind in the squally morning conditions. The technique, known as kedging, is legal providing there is no forward propulsion caused by the procedure, which took around 10 minutes to carry out. January 20, 2015. Day of 17 Leg 3 to Sanya, onboard Team Brunel. 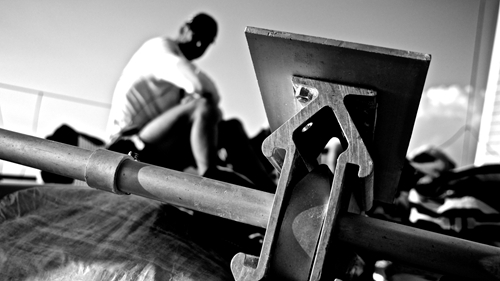 The anchor is prepared and ready to be deployed as the wind dies and the boat starts drifting backwards in the Malacca Straits. Fifth-placed Team Brunel (Bouwe Bekking/NED) and MAPFRE also followed suit for a short period before normal sailing was resumed. Boats in the last edition of the Volvo Ocean Race (2011-12) had to take similar measures as they approached the Leg 7 finish in Lisbon when the strong current caused a reverse tide flow in the River Tagus. The leaders have around 1,350nm still to sail with the most testing stretch of the entire 4,670nm leg from Abu Dhabi still ahead as they weave through a 1.5nm gap towards the end of the Malacca Strait, past Singapore, and out in to the South China Sea. For Caudrelier, so determined to make his mark in the Volvo Ocean Race history books in Sanya, it has been a tortuous time. Victory in Sanya would give Dongfeng Race Team the outright race lead after three legs. They set out from Abu Dhabi tied on four points with Abu Dhabi Ocean Racing and Team Brunel. "No wind, the current is against us. Our boat speed to the goal is maybe zero so it’s a nightmare for a leader,” he said. To add to his problems, the Malacca Strait is one of the busiest shipping lanes in the world and the fleet will need to dodge huge tankers while watching out for a mass of man-made debris plus all kinds of stationary and slow-moving fishing vessels.